Seeking Yoga? No Experience? No Worries! Collierville Yoga Specializes in Helping Beginners! Yin classes are suitable for anyone who is looking for a gentler more restorative approach. Vinyasa classes are an excellent choice for those looking for a faster paced practice and variety week to week. Ashtanga Vinyasa Half Primary (Also advertised as Basic Foundations) are suitable for beginners who are seeking greater flexibility, stamina, and strength. Inform your teacher of any recent injuries or previous conditions that have prevented you from being active. This way we can help guide you safely through each class. Consult your physician if you are returning from injury or an extended period of very little physical activity to make sure you are ready to tolerate a change in your activity level. Only do what you can do! Do what feels comfortable! Strength, stamina, and flexibility will develop over time! Success will take time, patience, and lots of practice! Never strain to the point of feeling pain! Rest if you are out of breath, feel fatigue, or you experience and dizziness during the practice. 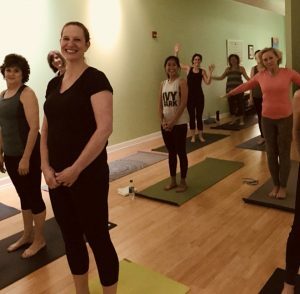 The vast majority of individuals, couples, and families who attend yoga class sessions at Collierville Yoga have never attended a yoga class before or have very limited experience. You are not alone. You will find our yoga community to be a very supportive and non-competitive refuge! You will find a wide diversity of people from all ages in our classes! The primary goals the teachers here at Collierville Yoga are charged with are maintaining your safety, helping you grow at a pace suited for your needs and desires, gaining maximum benefits, enjoying our tranquil practice environment, and have a sense of community that makes it easy to return practice after practice! Give us a try! We make it easy! We offer newcomers 30 days unlimited yoga for $30. You will not find an independent yoga studio anywhere with such affordable rates! Collierville Yoga offers classes in the mornings and early evenings seven days a week. If you are unsure of which sessions are suited best for you, please feel free to contact us. If you are still unsure, consider taking 1-2 private sessions with our experienced staff. In a private session, we are able to determine what level of practice you are best suited. To fully experience the benefits of a yoga practice, we recommend attending a minimum of 2-3 sessions per week. We find that the frequency in attendance is the best predictor of improved health and a greater sense of calm on a daily basis! Pre-booking for your weekly sessions is recommended and appreciated but not required.